Palacio 206 Free Seasonal Beach Service!! 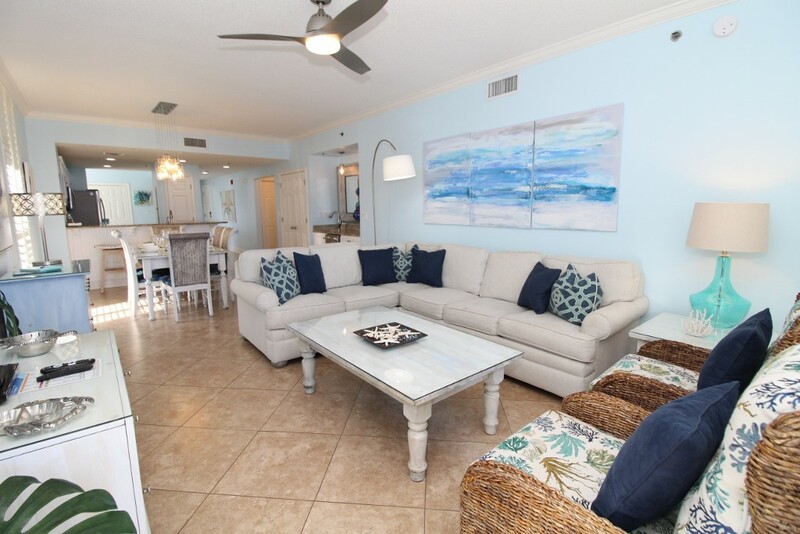 Escape from it all and discover the vacation destination of your dreams when you stay at our exquisite 3 bedroom, 3 bath west end corner unit at the renowned Palacio Resort in Perdido Key, Florida! 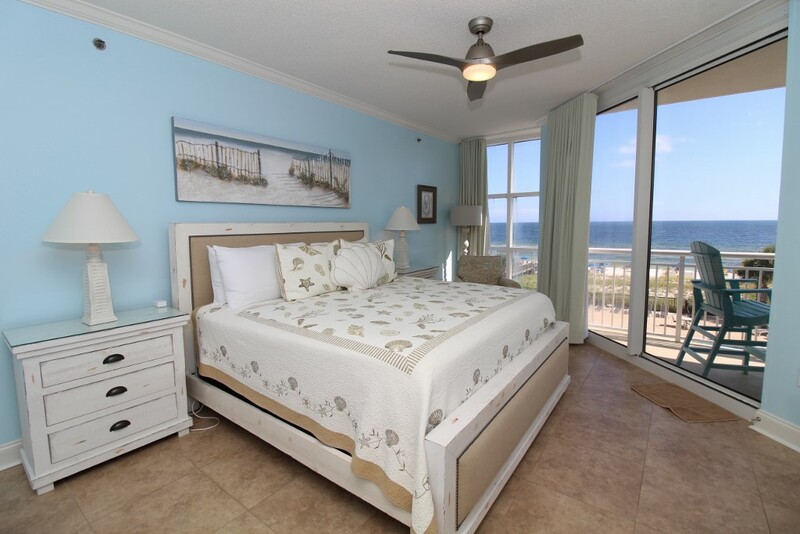 This spectacular 2nd floor beachfront abode features all the comforts of home, with lots of luxurious extras! 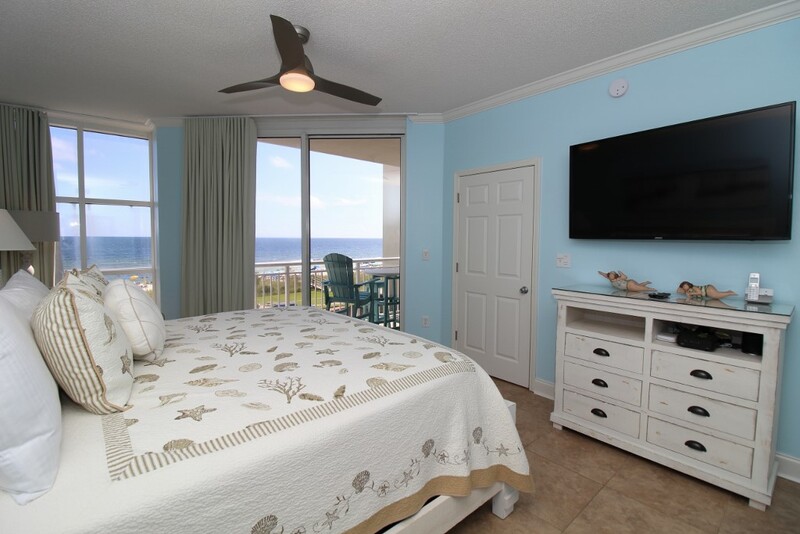 Granite countertops, wifi enabled Smart HDTVs, washer/dryer, recessed LED lighting, custom beadboard cabinetry, Samsung appliances and window treatments throughout are just a few of the high-end appointments that set this coastal retreat apart from the status quo. 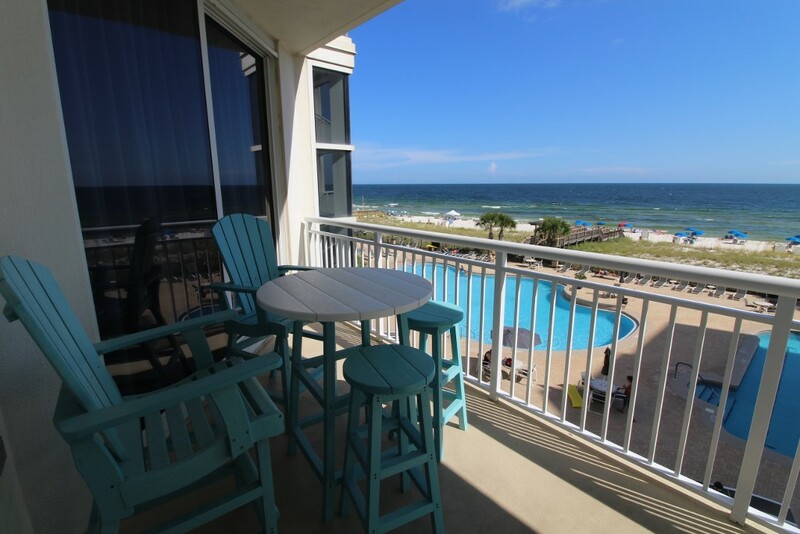 This exclusive corner unit floor plan offers a spacious open-concept layout with room to spare, plus a bonus north-facing balcony overlooking Perdido Key and complimentary seasonal beach service beginning March 2018! 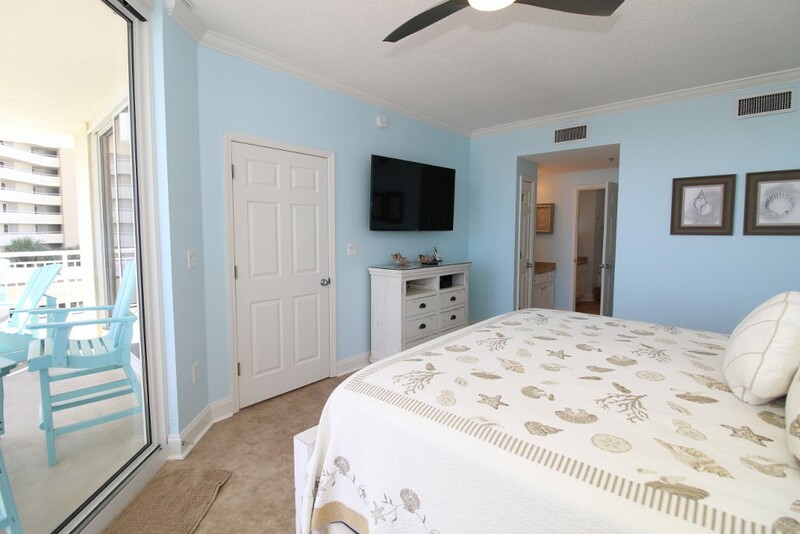 Inspired by the beauty and splendor of the coast, the space is adorned in a soothing palette of pastel blues and calming neutrals, accented with pops of color and bright patterns to give the space a relaxing coastal-chic vibe that’s both cozy and contemporary. 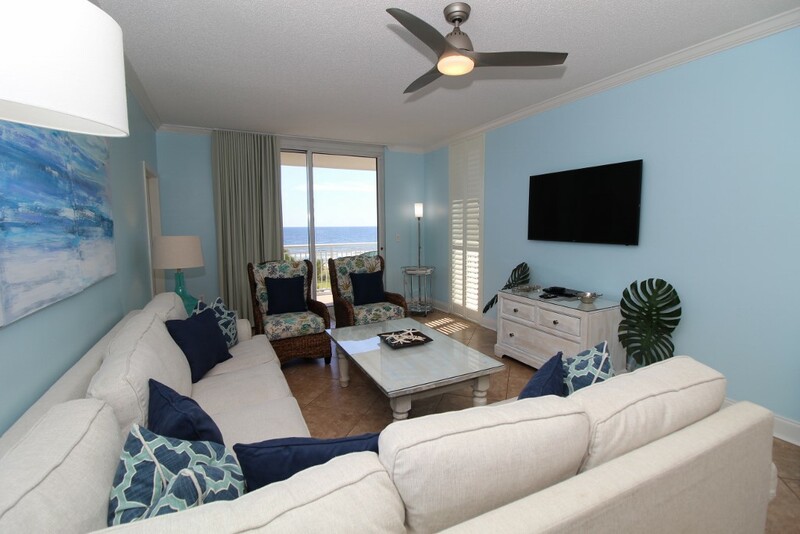 The living area is the perfect place to unwind, complete with a 55 inch wall-mounted Smart HDTV with built-in wifi. 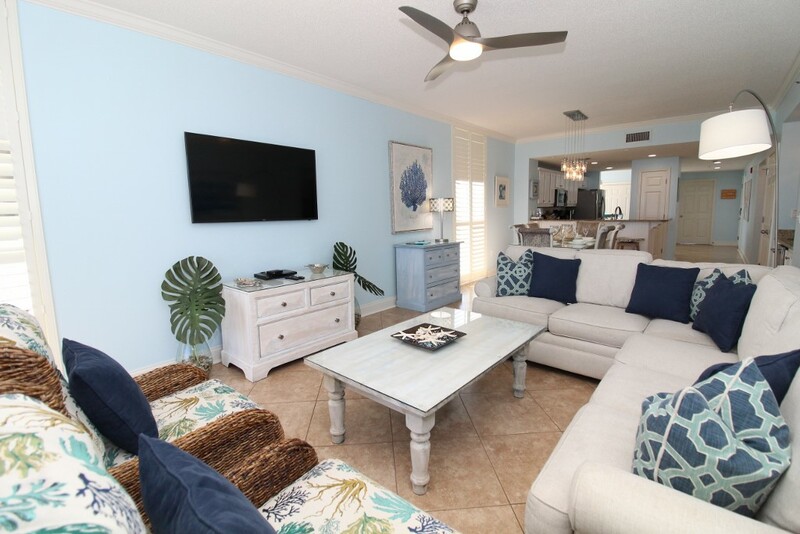 Perhaps our favorite feature, the living area is highlighted by floor to ceiling sliding glass doors that open up to the expansive balcony providing unobstructed views of sugar-white sands, turquoise emerald waters and bright blue sky stretch infinitely the sparkling Gulf of Mexico. 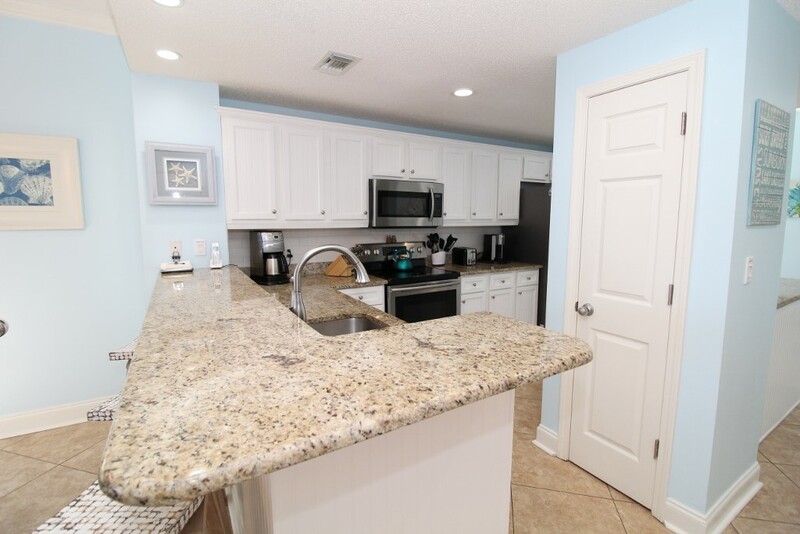 The updated kitchen is both beautiful and functional, and will surely inspire your inner chef! Featuring state-of-the-art stainless steel Samsung appliances including a French door refrigerator with in-door ice/water dispenser and bottom freezer, glass cooktop, a double sided stainless sink, Cuisinart 10-cup and K-cup coffee makers, plus all the small appliances, cookware and utensils needed, you’re only a dice, chop or flay away from creating a culinary masterpiece! 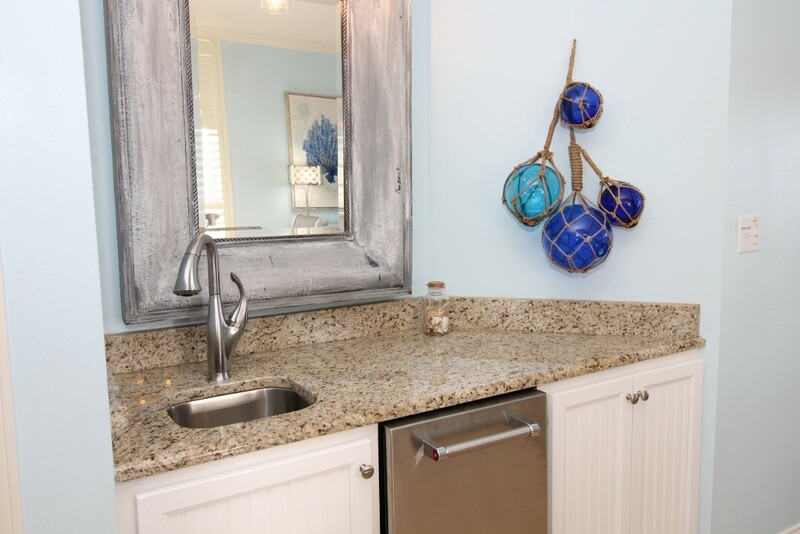 A breakfast bar and additional prep bar provide abundant counter space. 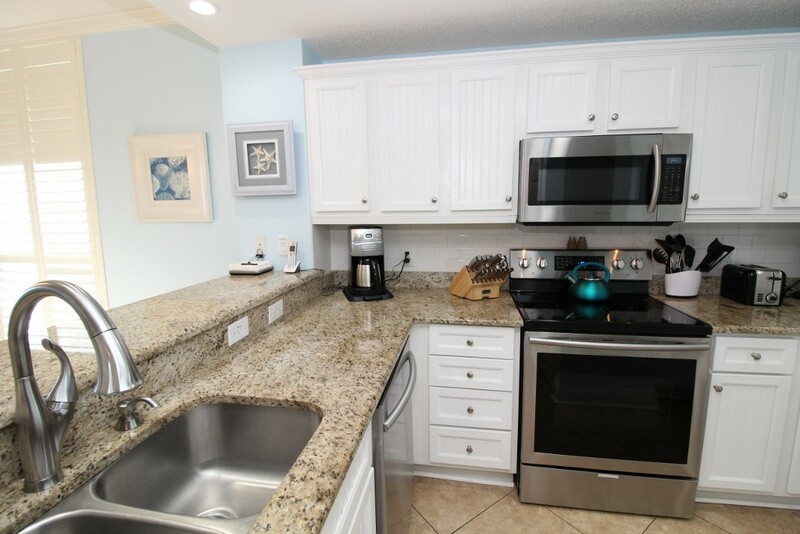 There’s even a separate wet bar with a KitchenAid under-counter ice maker. The dining area offers a stylish shabby chic dining table with seating for 6, and additional seating for 3 at the breakfast bar. 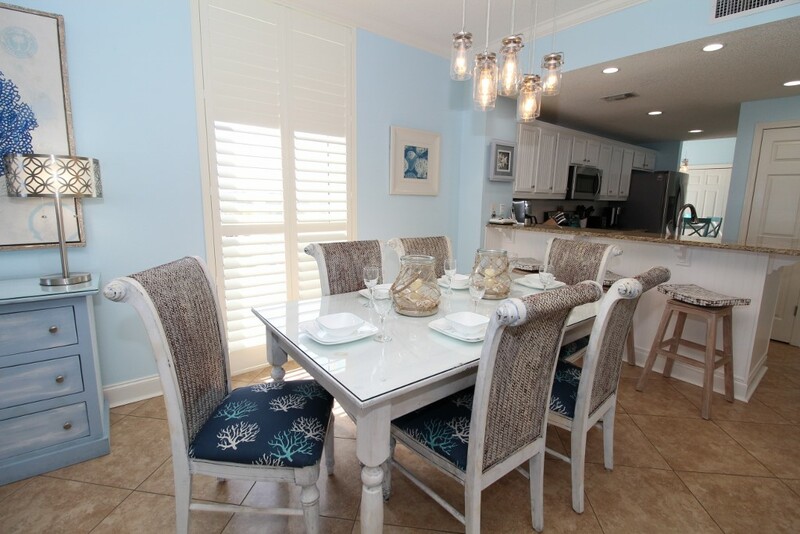 The bright and airy breakfast nook also hosts a new counter-height table with seating for 4! 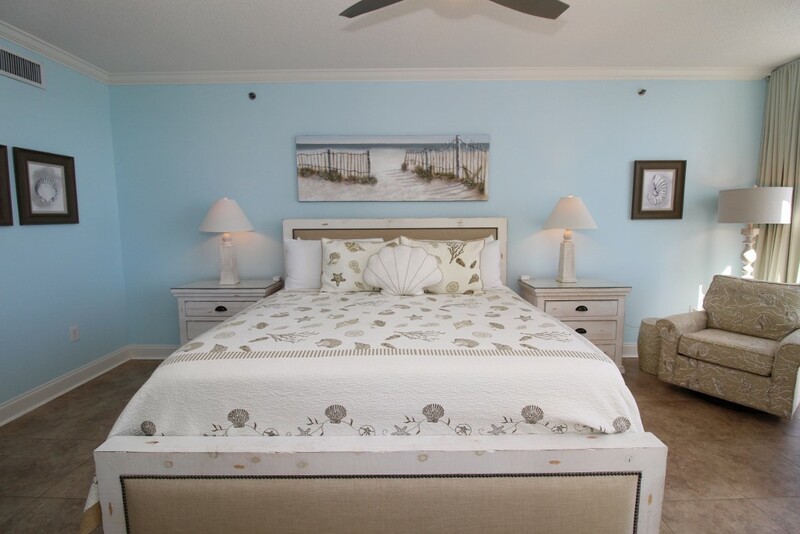 Retreat to the master suite and collapse into comfort with a king mattress layered with plush pillows, high thread count linens and luxurious bedding. 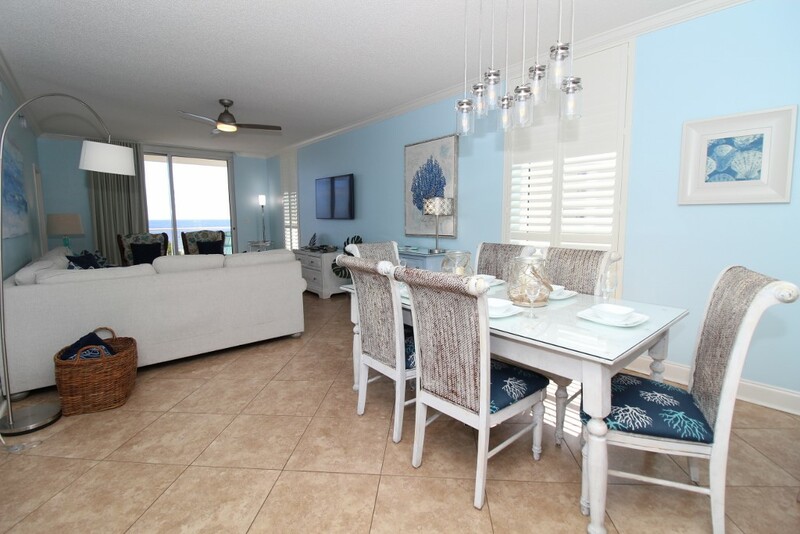 This opulent space also offers a 55 inch wall-mounted Smart HDTV and beachfront balcony access! 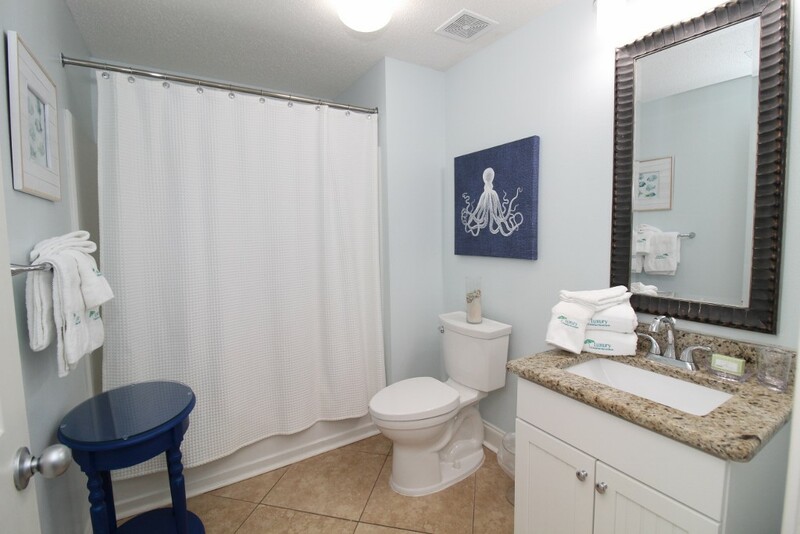 The ensuite bath boasts a spa-like ambiance, with an expansive jetted garden tub, huge separate walk-in shower with seating, and private water closet. 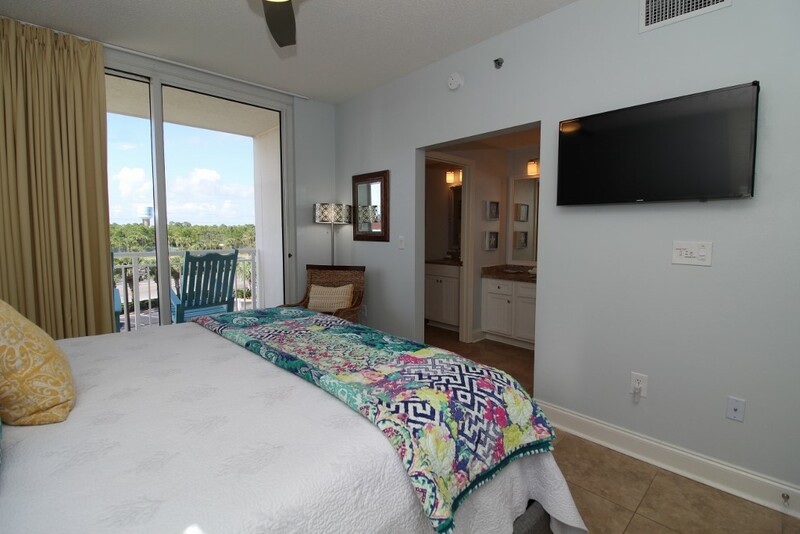 If you aren't lucky enough to end up in the master bedroom, don’t fret! 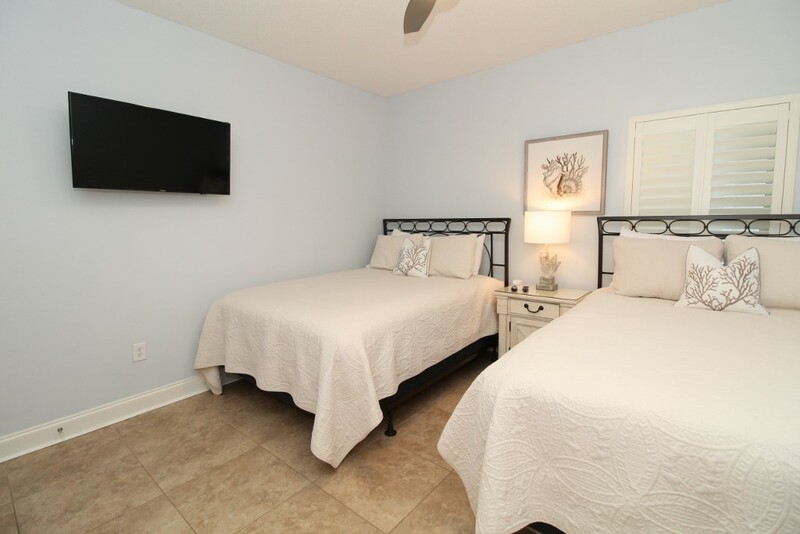 The additional guest bedrooms are equally accommodating, with ultra comfy beds, luxurious linens and deluxe bedding, and 40 inch wall-mounted Smart HDTVs with built-in wifi. 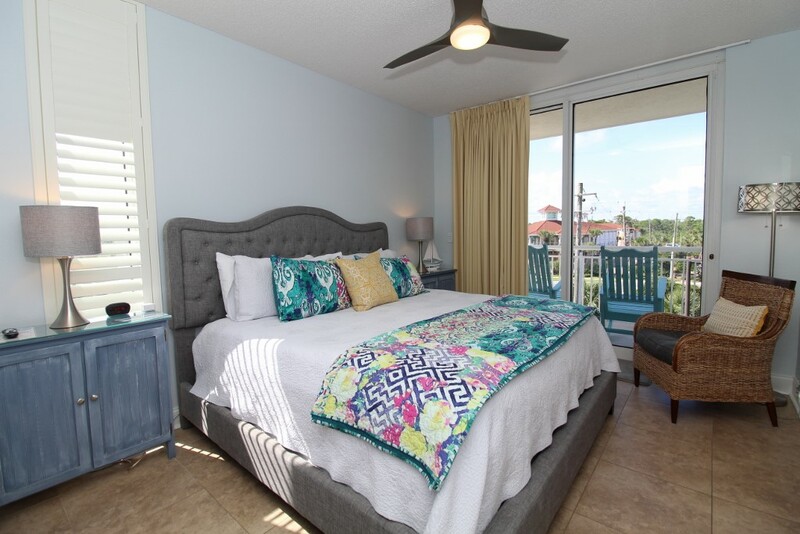 The 2nd bedroom offers another king bed, attached bath and north balcony access, and the third features two queens. The living room sofa can be converted into a queen sleeper, affording comfortable accommodations for 10 throughout!. Aside from the luxury touches featured in the unit itself, Palacio offers upscale amenities including two outdoor pools, hot tub, large private parking area with overflow parking across the street, fitness center, tennis courts, a charcoal grilling area and 400 feet of private sugary-white sand beach! Palacio has also taken measures to ensure the property is ecologically responsible! 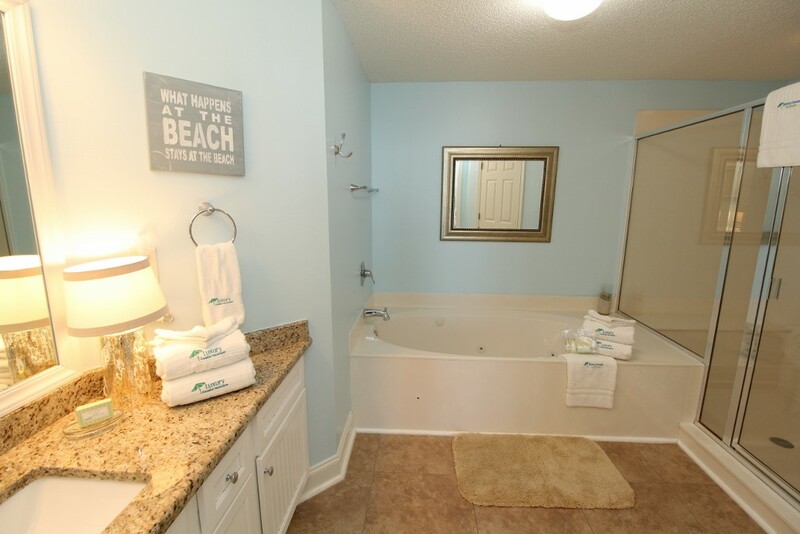 The property uses turtle-friendly lights, as well as a geothermal system that is environmentally friendly! 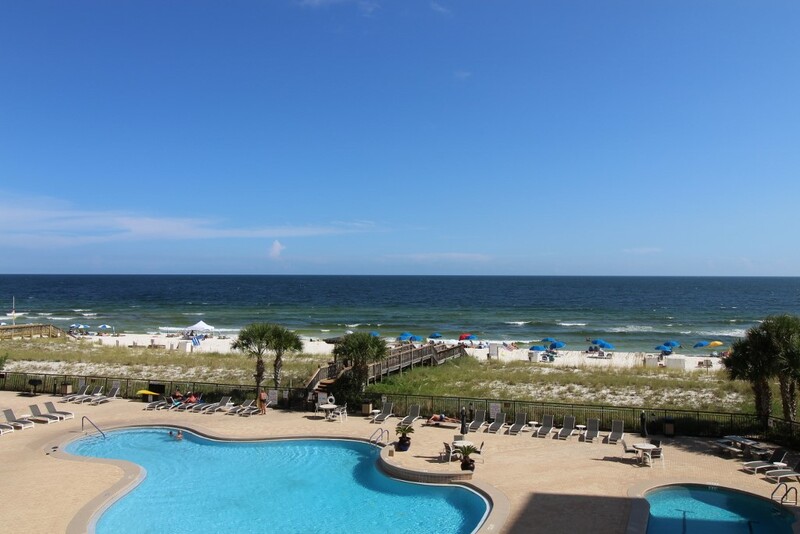 When staying in this beautiful rental you will also enjoy the services of a local liaison that will see to your every need throughout your stay with the premier rental company in Perdido Key. 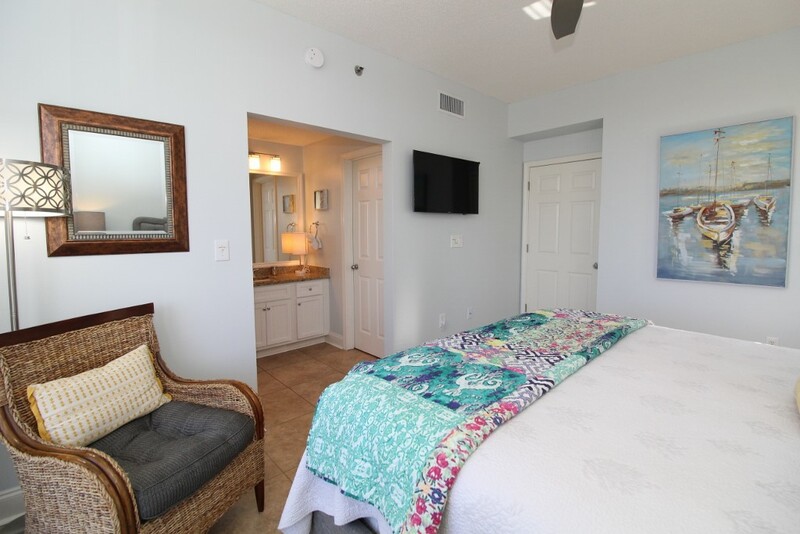 We offer 24 hour local support to make sure your stay is absolutely perfect and stress-free! Loved our time at Palacio in Unit 206! Excellent amenities! Tons of space! 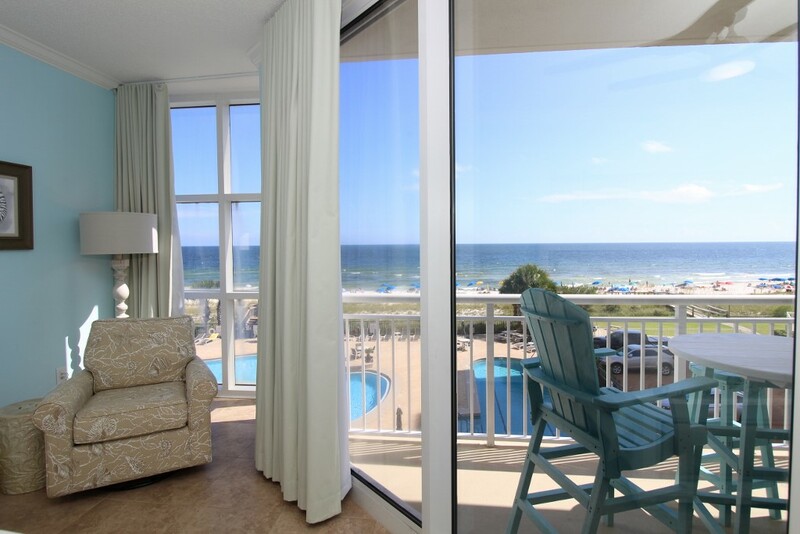 Our new favorite place to stay in Perdido! Hits 5 stars on every point! We have stayed in this condo three times. 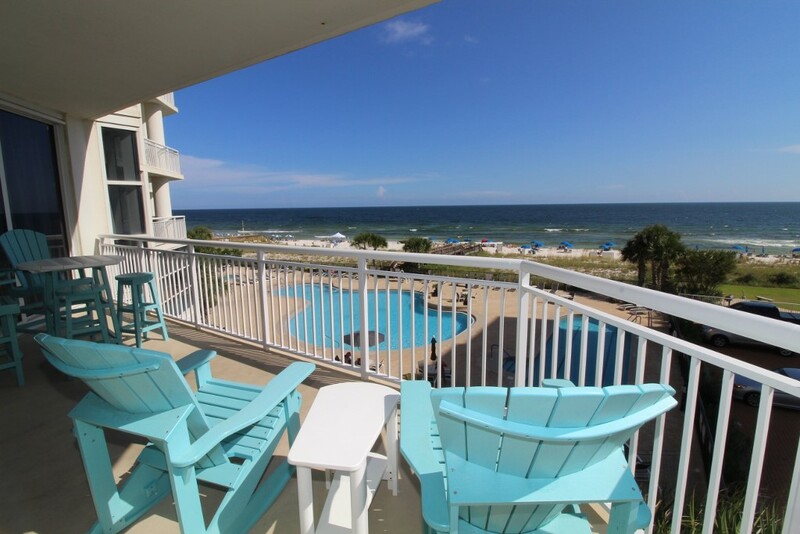 Would not stay in Perdido Key if this condo not available. 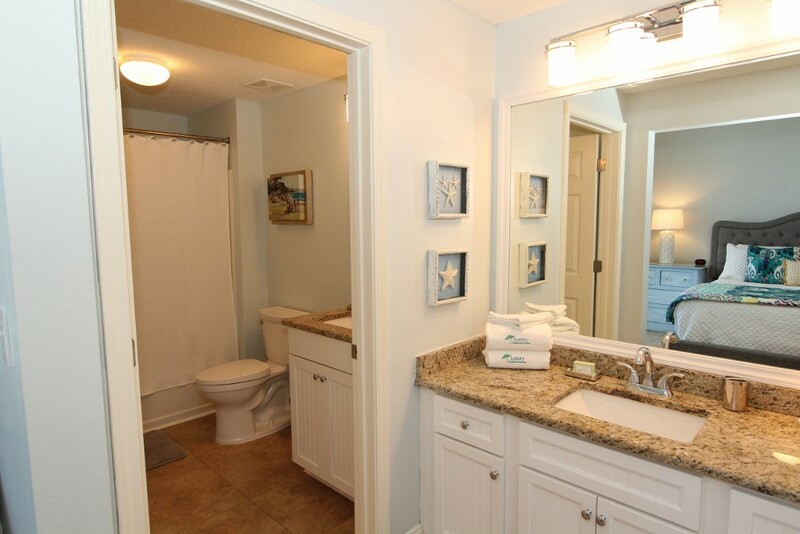 Everything was super clean, furnishings beautiful, and all the amminities one could dream of. 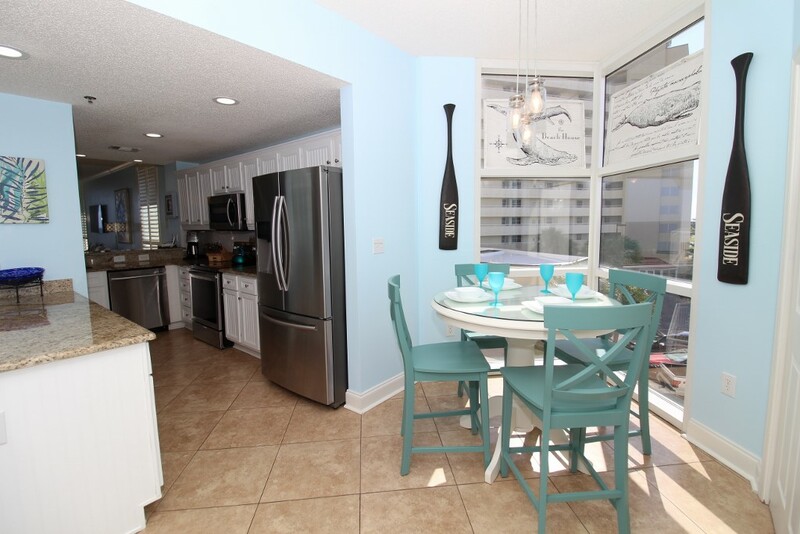 The kitchen is stocked with high-end appliances and an abundance of dishes and glasses. It is great to have an ice maker! I could not think of one thing it is missing or I would change. And of course the view is spectacular. I was totally content sitting on that patio enjoying the view while rocking in the wonderful rocking chairs. 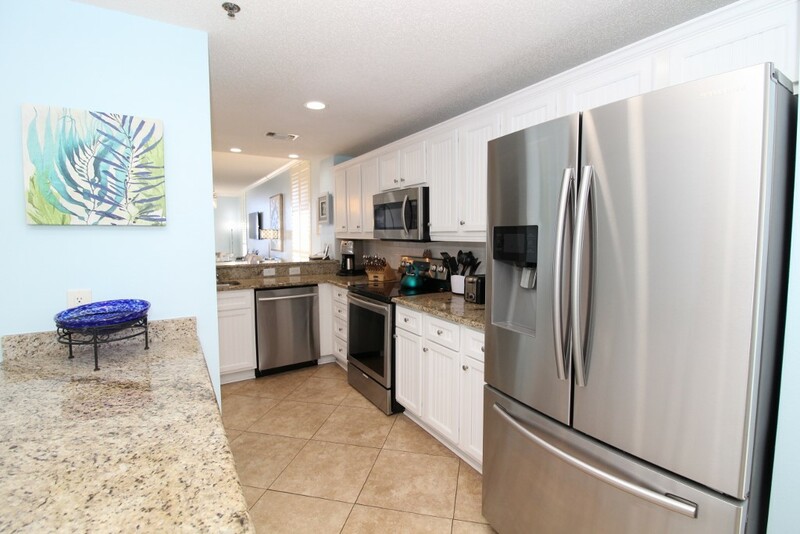 This condo was not only beautifully furnished and professionally decorated, it is spacious with new appliances in the kitchen. The kitchen was big enough to avoid bumping in others as meals were prepared, but not so big that cleanup was tedious. 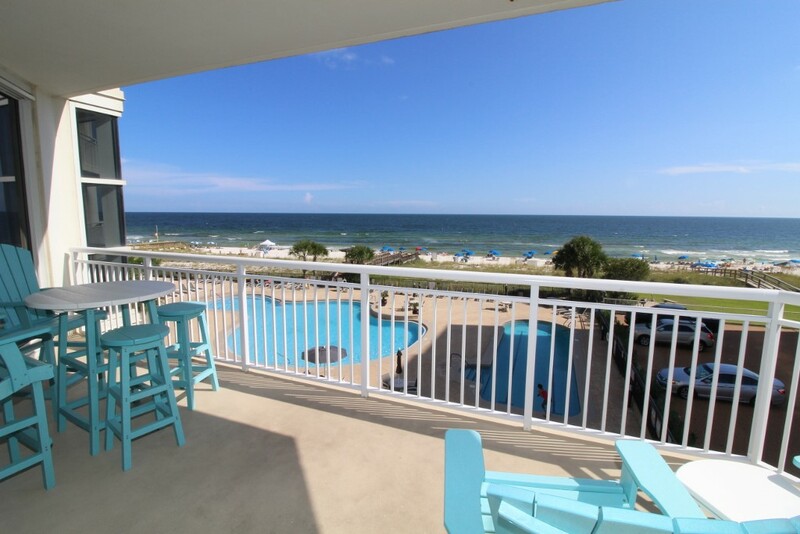 We sat on the large balcony and looked out over the beautiful Gulf of Mexico every night. 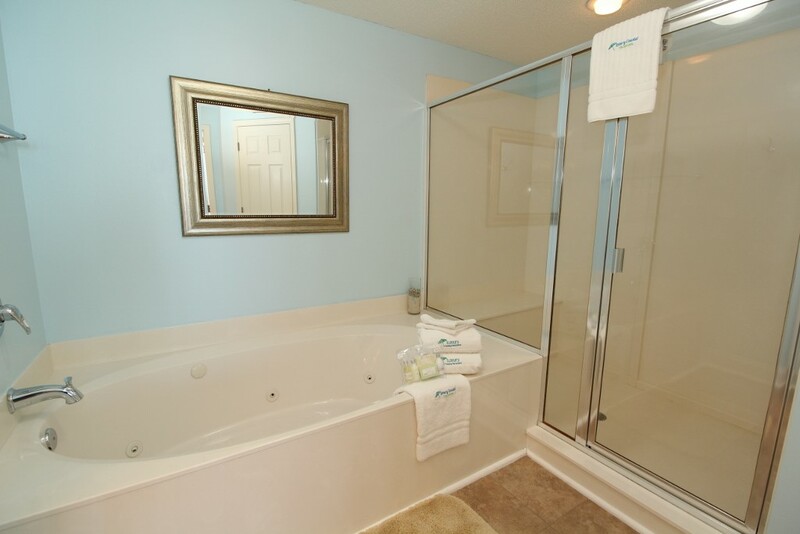 I really liked the way the bathroom had a separate sink outside the two guest rooms as well as a sink inside the bath, which made it easy for two people to use at the same time and still have privacy. A big plus was the ice maker in the bar area! The bar also was equipped with a powerful blender that we used to make icy beach drinks. 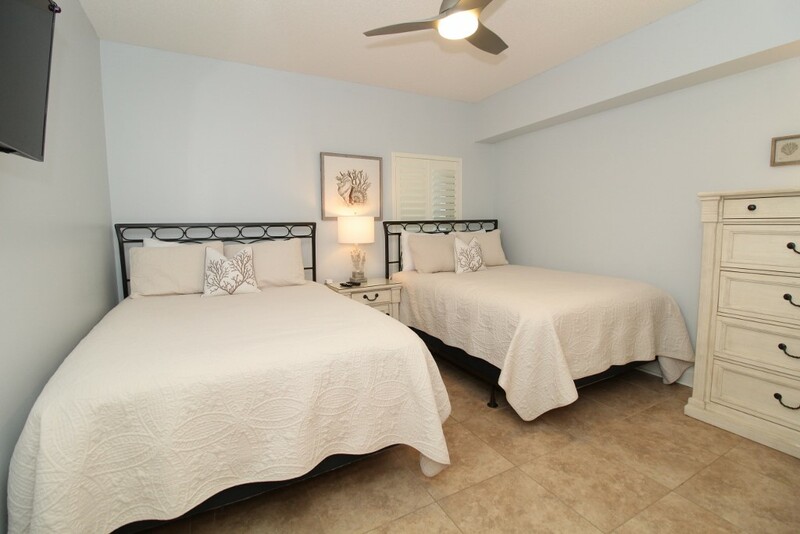 The bedrooms are comfortable and had plenty of pillows, too. 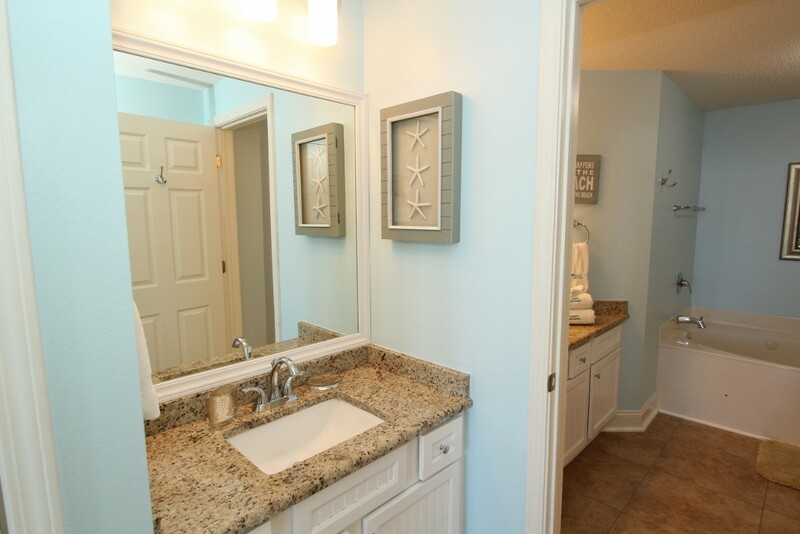 The location was great and within walking distance of shops and restaurants. I highly recommend this unit and hope to return soon. The best best unit we have stayed in and we've stayed in some nice units. High end appliances, some needed operating instructions. Owners have obviously furnished for themselves, even down to nightlights and TVs. 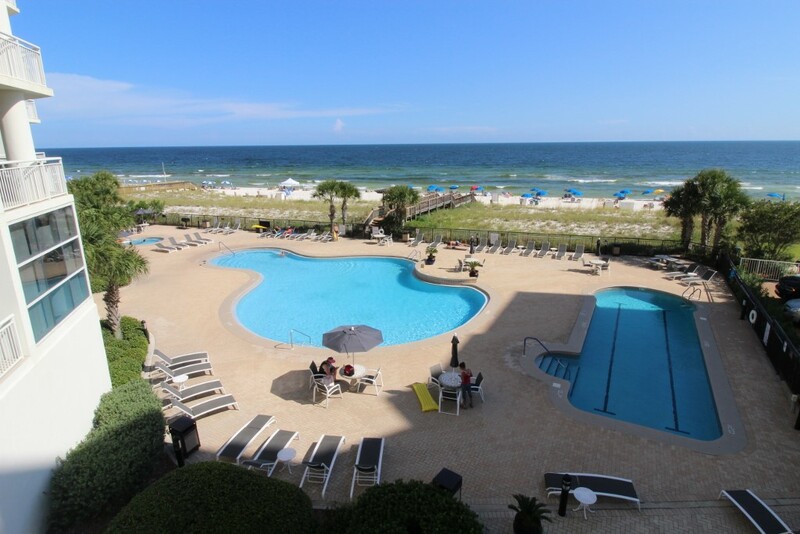 We will definitely attempt to rent this unit again. The separate ice maker is a bonus.